OnPoint Digital recently was a Sponsor for The eLearning Guild’s annual DevLearn Conference & Expo held at the Bellagio Hotel in Las Vegas, NV. The DevLearn event just turned ten years old and it has easily blossomed into one of the top L&D focused events anywhere in the world. This year’s conference had scores of preconference workshops, hundreds of concurrent sessions and more than 120 exhibitors for the 2,200+ attendees to take in and share. The event had three terrific keynote presentations capped with a fantastic presentation by Dr. Neil deGrasse Tyson, director of the Hayden Planetarium and host of the television show Cosmos: A Spacetime Odyssey, a reboot of the original1980s Carl Sagan PBS TV series. Dr. Tyson’s keynote proved funny, thought provoking and inspiring (as all great keynotes should be) and everyone who attended will remember it and him for quite a long time. OnPoint was extremely pleased to connect with more than a dozen customers and partners at DevLearn and happy so many of them got to know one another sharing their own experiences and best practices using our LMS/online and CellCast/mLearning solution sets. Customers and partners included DISH Network, IGT, Sony, Trivantis, Uline, Vertex, VGM & Associates, WW Grainger, and Medtronic amongst others. The Expo floor was hopping both days as well and a few hundred people participated in our “Dartman” challenge with three winner names drawn at random for $100 gift cards to their retailer of choice. OnPoint participated in four different featured and concurrent sessions over the event calendar including focused on our advanced support for the emerging xAPI protocol. 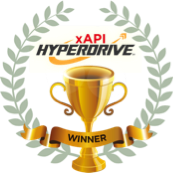 Robert Gadd teamed with Mira Mendlovitz of Grainger to present what proved to be one of the top three winning entries in the Guild’s first annual “xAPI Hyperdrive” competition, an open call for innovative entries from practitioners and vendors working in the xAPI/Tin Can space to showcase their approaches and tools that leverage xAPI to track formal and informal learning experiences. More than 80 entries were received and vetted, with a dozen entries selected to present to a panel of judges from industry and ADL. OnPoint’s entry demonstrated several advanced xAPI innovations including the use of deep links and QR codes to trigger informal learning activities in an LRS (“Learning Record Store”), offline support for xAPI statement capture/tracking from an installed app on a mobile device, and a clever “SCORM to xAPI” wrapper that can encapsulate existing SCORM-based content packages and convert those SCORM calls into xAPI-based statements without needing to update the SCO package. OnPoint is slated to showcase its xAPI advances at other ADL-sponsored events in the coming months including IT/SEC in Orlando in December. Finally, DemoFest was informative and entertaining with more than a hundred different teams showcasing their content projects and efforts. OnPoint customer DISH Network took Best in Show: Non-Vendor allowing us to bask a little in their glory. Way to go Adam, Ana, Megan, Megan (yes, two of them!) from DISH Network! 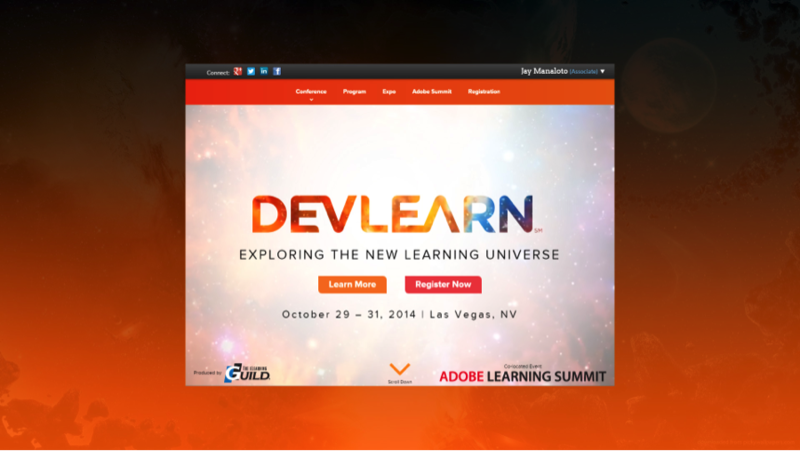 Overall, DevLearn 2014 was another great event and success for all involved and those who attended. Every L&D professional should consider it next year as their must attend event.